Besides, I'm getting a "Get me out of here!!!" vibe from a very claustrophobic baby. Somehow I persuaded Mr. Renn to watch Rocki's Prenatal Yoga with me... since we never made it to any lamaze class. Mr. Renn is such a good sport. I think I will keep him. After watching the Yoga/Lamaze video the baby was in a dancing mood, so we tried to videotape him bouncing from one end of my innards to the other. Right away he became inexplicably camera-shy. Darn. 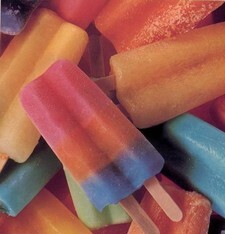 I think I have eaten almost 80 popsicles in the last 2 weeks. Somehow chewing on something cold but softer than ice just feels marvelous. I guess there are worse things I could be binging on. Otter pops are a good cold thing too- the Costco size, 200 pops, $5 or something like that. Prego yum! Wow, you're moving right along! That's exciting. Videotaping the dancy belly is a good idea. Maybe I'll pull our camera out tonight. . . but after reading your post I think I need to eat a popsicle first. Yum.